In a temp-tations® mixing bowl with a handheld electric mixer, mix together the cream cheese and butter until light and fluffy. Mix in 2 cups of the powdered sugar, slowly as to avoid making a mess. Mix well, then add in the flour, cocoa powder, brown sugar, vanilla and milk. Mix until combined and fluffy. 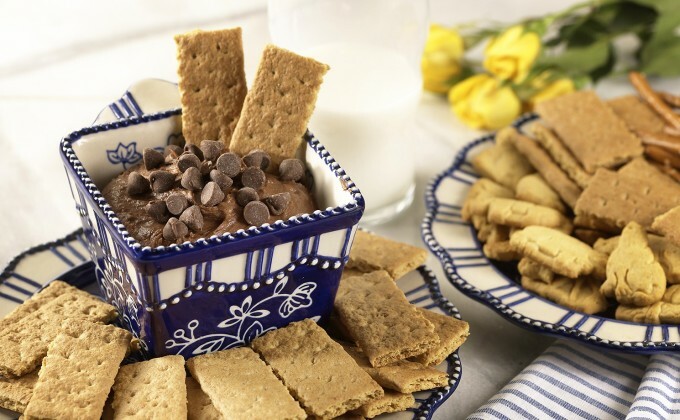 Garnish with chocolate chip and serve in a temp-tations® ramekin with pretzels, graham crackers, animal crackers, and/or fruit for dipping. Enjoy!